(Nanowerk News) Information is processed and transmitted by ever-smaller components, sometimes with electrons and sometimes with light. Scientists at the Max Planck Institute for Solid State Research in Stuttgart have now developed a light source which converts an electrical voltage pulse into a light pulse by means of a single molecule ("Dynamic Control of Plasmon Generation by an Individual Quantum System"). Here the molecule functions as a transistor-controlled light switch which even allows the intensity of the light to be regulated. Since the molecular switch allows the light to be switched on and off extremely fast, the light source could serve as a prototype for nano-components that convert electrical into optical signals with gigahertz frequencies. Today, organic dyes do not just provide colour for carpets, newspapers or clothing when light shines on them. Now they themselves shine in electric light sources, in organic light-emitting diodes (OLEDs), like those in smartphone screens. However, the displays still contain transistors for regulating the brightness alongside the actual light sources (pixels). A team from the Max Planck Institute for Solid State Research, the Max Planck EPFL Center and the Karlsruhe Institute of Technology, has now combined the two functions in a single molecule. 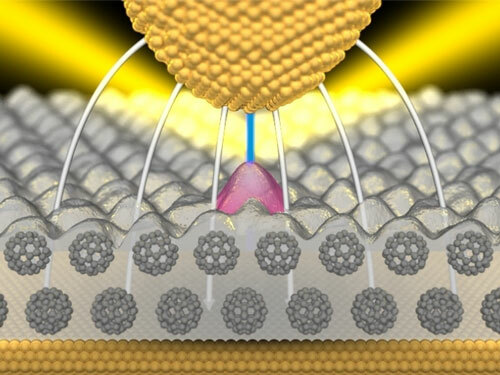 The researchers working with Klaus Kern, Director of the Stuttgart-based Max Planck Institute, construct their nanolamp with integrated transistor control by placing a dye molecule on a layer of Buckminsterfullerenes - which are spherical carbon molecules. The layer of carbon spheres coats a metal carrier, in this case of gold, which serves as an electrode. "As the second electrode above the dye molecule, we use the tip of a scanning tunneling microscope," says Klaus Kuhnke. "But a second metal layer would also be suitable.” However, the researchers were only able to discover the astonishing properties of the individual molecule because they used a movable tip for their investigation. What they actually did was to scan the surface with the tip, measuring the light emitted at the same time. "In the process we observed that light is produced on the dye molecules," according to Kuhnke. The researchers now regulate the electric field on the molecule with an electrical voltage between the gold carrier and the tip of the scanning tunneling microscope (STM), as well as the distance between the two electrical contacts. If this exceeds 2.5 volts per nanometre, the lamp is switched on. The molecule, however, does not just switch the light on and off. It actually allows continuous regulation of the light intensity, getting brighter and darker over a very narrow band of a few millivolts. It thus functions in this range similarly to a light-emitting transistor. The electrical energy is not converted directly into light energy in the switching process, but indirectly via "plasmons". These can be imagined as light waves that are trapped on the metallic surface and may be radiated by such things as surface irregularities. With their help, more information can be transmitted or processed in a small space in the form of light than with light alone: plasmons can run along metal tracks which are narrower than 100 nanometres, whereas optical fibres, for instance, must be at least half as wide as the wavelength of the light they transmit. The organic molecule plays a decisive role in the generation of the trapped and radiated light waves on the metal surface: a minimal change in the electric field at the location of the molecule decides whether light is produced or not. This makes the nanolamp interesting for the transfer of digital information with light, where "light on" stands for the one of a data bit and "light off" for the zero. "A small modulation of the electric field at the molecule produces a bit stream that is emitted as light and can transfer a message," says Klaus Kuhnke. And since a light source above the threshold value turns on with a tiny change in voltage, the switching process takes place extremely quickly: It takes less than a billionth of a second, and so may eventually permit data transfers with bit rates in the gigahertz range. The control of the intensity of the light by a single molecule is decisive for the speed of the light switch. Mechanical light switches are operated by a lever, and the heavier this lever is the more effort it takes to move the switch from one switching position to another. These clumsy levers correspond in electronics to unavoidable capacitances which swallow a part of the current without producing any light. The larger the light-switching element is, the more time and energy is required to charge the "parasitic" capacitors. Here the minute size of the molecule helps: It costs hardly any additional energy to charge the environment of a single molecule the size of a millionth of a millimetre with a tiny voltage of a few millivolts - the switching process is correspondingly fast. "Such a molecular light source thus promises to become a new, efficient component for information transmission - especially as the light produced may still be weak, but is clearly perceptible with the naked eye," says Klaus Kuhnke.